It doesn't start that way. Believe it or not I usually plan a few meals before leaving home so that I know what I'm going to need both in the way of groceries and cooking gear too. The whole trick to packing a truck for a successful trip is to keep it as light as possible. So if I can leave a few pots at home or whatever I do exactly that! Not like some people I can name who take absolutely every camping tool they have with them wherever they go. Not you Chooka, you're more the 'cook it on the shovel' type of guy but I was thinking of our old mate Dingo Dickson here. Silly bugger carries about fifteen different ways to cook a feed for a weekend camp! Right, so we're camped on this brilliant headland and all I've got left is mostly scrambled. At first this was going to be a beef pie but Gleno had ripped into the steaks the night before - another hazard when you're travelling with blokes who love their food - and the pastry sheets had rolled themselves up into a blob of urrky muck. And the eggs were scrambled, really scrambled. But I had the old standby of a few tins of condensed mushroom soup, Glen had some lamb chops and a tube of mint and Kenno found a bag of carrots. That's the stuff I chose because I knew it'd go together. OK, so I hoped it'd all go together. Turns out it did, which was kind of lucky. Or we'd have had to cook Kenno's thongs in tomato soup. 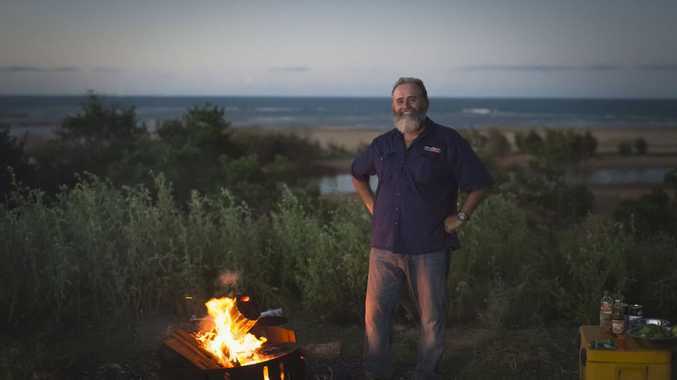 Roothy's camp cooked lamb secrets: John Rooth lets you in on some tasty tricks. 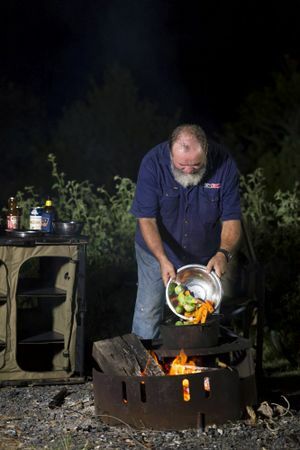 Cook up the lamb chops in a camp oven over the fire. 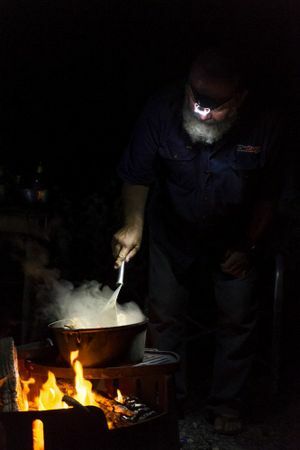 Obviously you could do this with the gas ring and a frying pan but make sure you've got a lid or some sheets of alfoil if that's the way you play because a good long cooking session in the pot is what really makes this one work! With the chops mostly cooked I lobbed in some chopped onions and the best part of a bottle of garlic, honey and soy sauce. You could use oyster or soy sauce about now with a teaspoon of brown sugar to sweeten it if that's what you had on hand but the garlic always works with lamb and shouldn't be missed out on. I'd have liked to use fresh garlic but as usual the fresh stuff had annihilated itself in Milo during the big track shuffle we'd done the day before. Hey, all I can say is that you'll never see me on the Bouncing Castle - I've done that too much already! With the onion starting to brown I dumped - sorry, placed carefully - the rest of the ingredients in the pot. The condensed musho soup went in as is - all goopey - and a tube of mint jelly added the necessary tang. Some beer followed - actually, truth be told there was beer before, during and after - and that's what liquified the soup so to speak. Then I put in the veggies which were virtually the only ones that we had left that weren't looking kind of black but fortunately, they too suited this meal. After a big stir the lid went back on and we left the whole plot to soften up for a half hour or so with coals top and bottom. Yep, and it was absolutely beautiful too! The chops fell to bits and with those strong flavours of mint, garlic and mushroom this stew turned into a real classic. Give it a go, you'll be pretty impressed!